There are a number of perspectives from which this question can be approached. We will focus on only one in this brief. The purposeful development of academic initiative(s) designed to secure an institution’s, school’s, college’s, or program’s strategic position in the competitive global digital learning marketplace. Why are academic strategies important? Academic strategy is essential in developing quality, effectiveness, efficiency and sustainability in colleges and universities. Another major reason in today’s world is the massive paradigm shift to a Global Digital Learning Ecosystem. The new learning ecosystem is ubiquitous (everywhere), content rich (has everything), and is available to the learner at precisely the time when they need or want it (convenient). The new ecosystem provides unprecedented learning access to digital native populations (by definition under 35 years of age, but significantly broader than that). Digital communications provides unprecedented access to information, thought leaders, knowledge providers, learning communities, curricula, creative tools and tutorials. The new learning ecosystem changes all of the academic rules of engagement. What are the implications of the paradigm shift and its impacts on colleges and universities? Because the new paradigm and the new global digital learning ecosystem changes all of the academic rules of engagement, planning must focus first and foremost upon the master academic plan for the future. This means the MASTER ACADEMIC PLAN assumes primacy in the institutional planning hierarchy. Serving as a Master Plan it guides the other plans and nurtures the institution’s energies toward the new paradigm. Are academic cultures too parochial and focused upon self-interest to make the transition? Certainly some are, but by no means all. There are a host of academic visionaries that lead the transition into the future. Further, we must remember that not all resistance is due to parochial self-interest. A great deal of consternation occurs over concern for the best interest of the learner and what is believed to be the holy grail of quality undergraduate education—small class size. Legitimate concern sets off a myriad of myopic arguments fed by beliefs of what is coming rather than deep reflection about what should a college or university look like in the new global digital learning ecosystem. MIT faculty have taken a very deep look at that very question. Certainly the founders of EdX, Harvard, MIT, Stanford, their 38 charter members, 27 members and 7 national and regional consortia adopting the EdX platform. The founding of Western Governors University is testament to the transformation. Georgia Tech’s new OMSCS in partnership with Udacity and ATT is a great example that academic cultures, programs and institutions can move judiciously toward optimizing the emerging global digital learning ecosystem. How can an institution proceed using small steps that build toward a larger transformation? The development of academic strategies is a complex undertaking. The first assumption centers on the principle that “Curriculum drives enrollment, enrollment drives revenue, revenues drive everything else!” This principle of sustainability translates into two primary focal points for academic strategy, the curriculum, and the learner. The economic challenges of sustainability are not counter to academic quality they must be synergistic with academic excellence. Focusing upon learners first provides a clearer perspective of the individuals who seek, find and enroll in programs of study. The learner-centric approach must simultaneously focus on the tenets of academic quality and effective learning. To foster this focus, we have developed the Learner Centered Curriculum Framework around seven strategic questions guiding academic planning. What objectives do the learners seek? What learning provider models are available to the learners? What is the optimum curriculum architecture for an institution or educational entity? Answers to the seven questions orient the planning and analysis discussion on an integrated array of factors that must be considered as institutions ponder pathways to sustainability. Each of the seven questions must inform and be informed by the institution’s overarching strategy for sustainability, strategic position in the academic marketplace, and performance in terms of utilization of resources and educational outcomes. Answers to each question help inform and build the master academic plan. The master academic plan informs and sets the strategic framework for recruitment, retention and operational portfolios and performance. Policy enables and assures effectiveness, efficiency and overall quality of the enterprise. Analytics informs all aspects of strategic and operational functions. The intersections in the matrix establish deep queries and framed analysis of the relationship of the institution and its master academic plan to the global learning marketplace. One fundamental element of that analysis is the strategic analysis and evaluation of the institution’s curriculum architecture. The task of assessing the existing curriculum architecture against the seven dimensions of strategic enrollment management has resulted in the formulation of a proficiency based curriculum architecture model. The new model is built from the IMS chassis of Reusable Learning Objects and Modules existing courses and programs, and the recognition that communities of practice are beginning to drive new program planning and expanded views of the value of state-of-the-art curriculum. 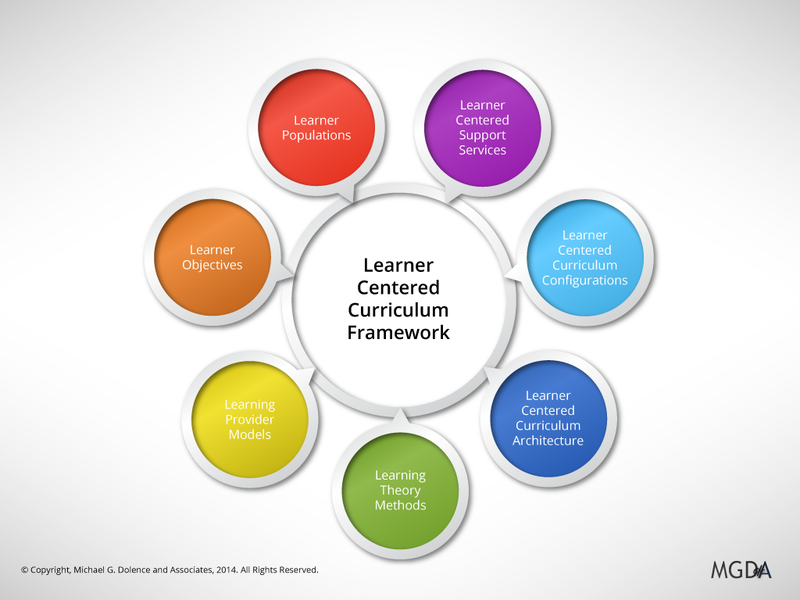 The proficiency based curriculum architecture model provides for the design, development and implementation of more granular curriculum, that can be assembled and reassembled into programs that address credit bearing curricular applications as well as practice based applied learning requirements. The model expands the usefulness and application of curriculum to a much broader educational marketplace. The new expanded view of curriculum provided by the proficiency based curriculum architecture model opens new options for higher education. The development of academic strategies involves manipulation of variables within an educational entity (e.g. institution, college, school, program, or department) in order to gain strategic position in the global learning marketplace. The development of academic strategies is both art and science and is enhanced by the depth and breadth of knowledge of the options available to an academic strategist. Academic strategy development requires both systems thinking and contemporary knowledge of cognitive research and learning strategy. The following, while not exhaustive provides a foundation for understanding the roots of academic strategy development. Term Variables: adjust enrollment periods to align with market segments requirements or shorten time to course completion. Examples include 4 week term, 8 week term, 15/16 week term or open term. Schedule Variables: adjusts synchronous learning engagements to align with market segments requirements. Examples include traditional day schedules, weekend colleges, and evening schedules. 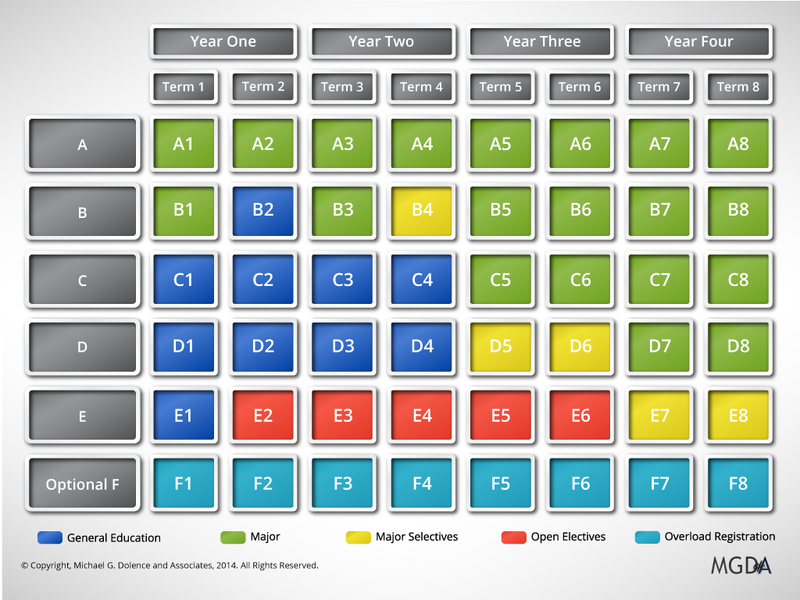 Granularity Variable (see proficiency based curriculum architecture model, above, with 7 Tiers rather than 2): adjusts curriculum content, courses, and engagements into smaller components permitting deeper assessment, application across multiple programs of study, and access for necessary developmental coursework. Curriculum Scope: defines the breadth and depth of academic programs in an institution’s portfolio. Community of Practice Focus: identifies trans-disciplinary, interdisciplinary and multidisciplinary programs of study designed to address emerging needs of society and concomitant interests of learners. Discipline Focus: provides a clear definition of specific elements of content for promotion and consideration by learners, employers, faculty, and philanthropy. Integrated Assessment: allows the assessment of learning and curriculum, including the collection of data associated with it, to occur routinely within the curricular engagement process. 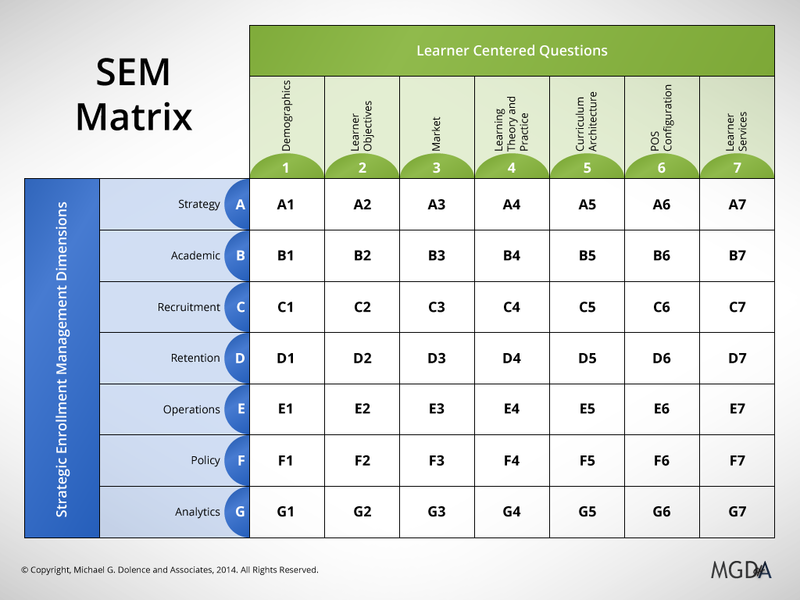 Digital Assessment Support Systems include a wide range of digital formative assessment tools as well as systems for learning outcomes management (i.e. Canvas, Angel Learning). Campus Master Plan: provides a rational design view of a campus and the strategies to create an effective, efficient learning environment supporting the academic community. Academic Facilities Portfolio enhances specific academic facilities to highlight their design features that promote effective learning and scholarship. Learning Management Systems (LMS): is a software application for the administration, documentation, tracking, reporting and delivery of digital courses. The use of LMS as a strategic element provides unprecedented information and control over digital curricula and learner assessment and engagement. Digital Learning Environment (serving synchronous and asynchronous learning engagements) recognizes the ubiquitous critical mass of digitized information and resources, creative tools and communications options open to learners, scholars and academic leaders. Packaging (See Georgia Tech, Western Governor’s links above) push the boundaries of existing portfolios by combining the pieces in creative and effective ways. Transformational efforts redefine the rules of engagement to optimize position and performance in a new paradigm. Preeminence defines efforts to achieve the acknowledged status of best of breed. The need for forward thinking academic strategies is demonstrated daily across higher education. Institutions considering changes to their core curricula, departments developing new programs, schools and colleges developing strategic plans or Master Academic Plans, institutions developing academic enrollment management initiatives, institutions approaching accreditation review, re-accreditation processes or responding to findings from a review are just a few of the prompts for deep thoughtful reflection on academic strategy. 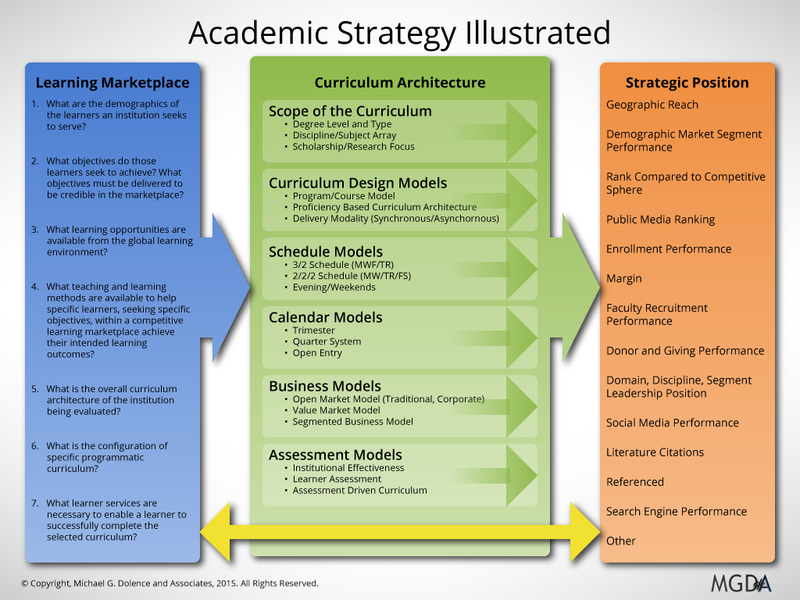 Note: This brief Primer is designed to illustrate the elements of academic strategy and how they relate to each other. It is neither complete nor exhaustive. This is the sixth post in the series on Academic Strategic Enrollment Management. One of the most profound developments in Academic SEM is the emergence of a Proficiency-Based Curriculum Architecture Model (PBCAM). Its development and continued evolution are the results of a synthesis by a number of scholars, communities of practice and higher education associations. The Proficiency-Based Curriculum Architecture Model is driven by and feeds the continued evolution of the global learning ecosystem. It is built upon a digital learning framework and serves to restructure the basic architecture of higher education’s curriculum. An institution’s curriculum architecture defines the essential components of its curricular system; maps the interrelationships between the components and the environment, and specifies the system’s intended learning and award outcomes. Put simply, the curriculum architecture synthesizes the many institution-specific design and delivery decisions inherent in curriculum management. The scope of the emerging Proficiency-Based Curriculum Architecture Model embraces learning leading to an accredited formal educational credential and extends to include the universe of practice based educational experiences. Practiced based curriculum has historically been considered not for credit in a collegiate program of study. The lines have become blurred as new learning experiences are built and experienced and woven into the for credit curriculum. An example of the implications of the Proficiency-Based Curriculum Architecture Model considers the Kahn Academy’s inventory of learning objects and their integration by the learner into their collegiate experience. Until now there was not a structure within a collegiate curriculums architecture to accommodate the experience. This domain tracks program term parameters (calendar), schedule model parameters, delivery modes, facilities implications and other delivery specifications. Of these domains, the basic structural elements of the programs of study define the learner’s curricular experiences and provide for the primary value assessment of a credential. The POS and the courses that build the cumulative knowledge and skills are essential to positioning an academic offering in the 21st century global learning marketplace. The system that is now in place is structurally two tiers that link the program of study to required course experiences. The managed components of curricula consist of the top tier referred to as the Program of Study or POS. The program tier consists of a prescribed number of roughly sequential course experiences designed to culminate in a credential. A typical baccalaureate program of study is five courses per term over 8 consecutive terms summing to 40 courses earning a minimum of 120 credits. The second tier is the Course. Courses are defined in terms of seat time equivalency and calibrated to credits. A three credit course is typical. Courses in this example are delivered over a 15 week term requiring 3 hours of faculty contact per week for a total of 45 contact hours. In addition, students would be expected to spend 6 hours per week reading, preparing, and problem solving, or studying the material for an additional 90 hours of learning the experience. Combined these two basic course elements sum to 135 hours of learning engagement and earn three credit hours. Learning is assessed primarily through summative course assessments in the form of midterm and final exams with further evidence supplied by a term paper, quizzes or a project. A new model has evolved since 1995. The new model begins with the understanding of the emergence of learning objects and their role in constructing curriculum architectures. Learning objects are the smallest component of the curriculum. They form the foundation of a structured curriculum, are integral to learning and are used to build pathways to higher level cognitive awareness and understanding. The content within learning objects has always been integral to the teaching and learning processes. The shift to digital learning environments enables discrete digital lessons that can be created, stored, used and reused, labeled (tagged), mapped in sequence, coupled with specific formative assessments, and integrated into larger cohesive curricular structures. In 1995, IMS Global Learning Consortium (IMS GLC) came into existence as a project within the National Learning Infrastructure Initiative of EDUCAUSE. While IMS got its start with a focus on higher education, the specifications published to date as well as ongoing projects address requirements in a wide range of learning contexts, including of course K-12 schools and corporate and government training. The primary focus of the initiative and the work of the consortium involve the establishment of standards for the emerging digital learning environment especially with respect to the formal curriculum. On June 25 1999 Cisco System published version 3.0 of their Cisco Systems Reusable Information Object Strategy: Definition, Creation Overview, and Guidelines marking a key milestone in the evolution and development of the use of objects. The RIO Strategy is built upon the Reusable Information Object (RIO). An RIO is granular, reusable chunk of information that is media independent. An RIO can be developed once and delivered in multiple delivery mediums. 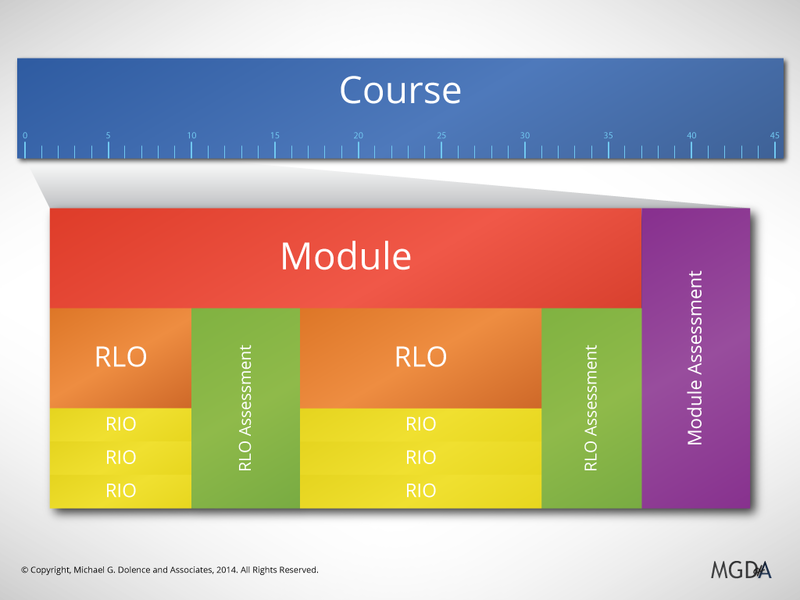 Each RIO can stand alone as a collection of content items, practice items and assessment items that are combined based on a single learning objective. Individual RIOs are then combined to form a larger structure called a Reusable Learning Object (RLO). Objects are then combined to build modules, and modules are combined to build courses. An object must be able to be stored, retrieved, indexed, referenced and used directly by the learner. To achieve this means that it must be labeled with ‘metadata’ or tagged with keywords in order to facilitate the function within a digital archival system. An object once cataloged and warranted for credibility should serve the learner in different instructional and learning contexts. The object should function independently from the learning management system, curriculum or content management systems, student record and registration system. The Course Curriculum Flow Model diagrams a course design into a sequence of related experiences and maps them in a time framework. The model provides a structured means of defining, combining, and developing learning experiences built upon a fine granularity assessable learning engagements building toward proficiency. The course then plugs directly into the existing Program of Study diagramed in Figure 1: The Program of Study. Academic degrees and credentials are much more than just a random assemblage of learning experiences. Two fundamental drivers guide them. 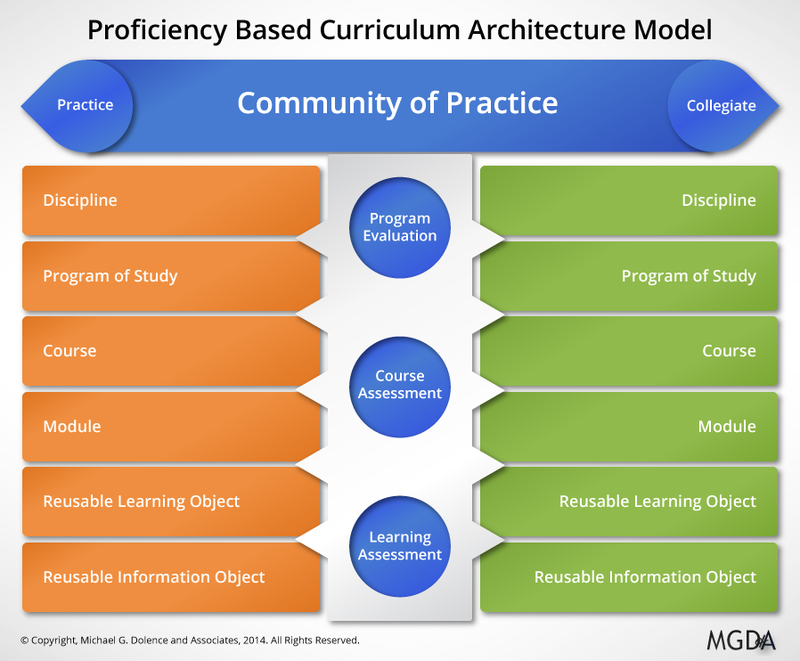 See Figure 2: The Proficiency-Based Curriculum Architecture Model. The first driver is the structure, focus, and rigor of academic disciplines. Disciplines historically drive credential development and anchor the credential on a bedrock of scholarship, reason and accumulated research. The second driver involves the structure, focus, and rigor emanating from trans-disciplinary Communities of Practice (often referred to as CoP) as the framing construct for the overarching scope of the curriculum. Communities of practice are formed by those who engage in collective learning within a shared domain of interest and through that interaction develop shared practice over time (Wenger, 2011). A community of practice curriculum is an emergent learning pathway for practitioners and scholars who share a common interest in or focus upon an area of research or scholarship that crosses disciplinary boundaries. The Proficiency-Based Curriculum Architecture Model recognizes the multi-disciplinary and interdisciplinary nature of communities of practice and bridges between Collegiate/Scholarly offerings (arrayed down the right side) and Professional Practice offerings (arrayed down the left side). The feature, thereby, anchors the curriculum in both the scholarly and practitioner realms, forming the foundation for a Scholar/Practitioner curriculum. The discipline layer in the Proficiency-Based Curriculum Architecture Modelrecognizes that community of practice learning needs are translated and organized by discipline or field of study experts into programs of study. In turn the formal curricular structure provides a sequential term/course view of the learning opportunities designed to meet the needs of those wishing to enter or continue learning within a community of practice. I hope this brief sketch provides an evolutionary view of how the foundations of curricular innovation are driving the future of Academic Strategic Enrollment Management. The emerging Proficiency-Based Curriculum Architecture Model permits dramatic expansion and integration of collegiate curriculum into the continuing education and learning requirements of the new millennium. Stay connected and engage with your colleagues join the ASEM Group in Linked In, and join us in Claremont on December 8th for the Institute for Academic Strategic Enrollment Management and Sustainability where we will discuss the Proficiency-Based Curriculum Architecture Model.